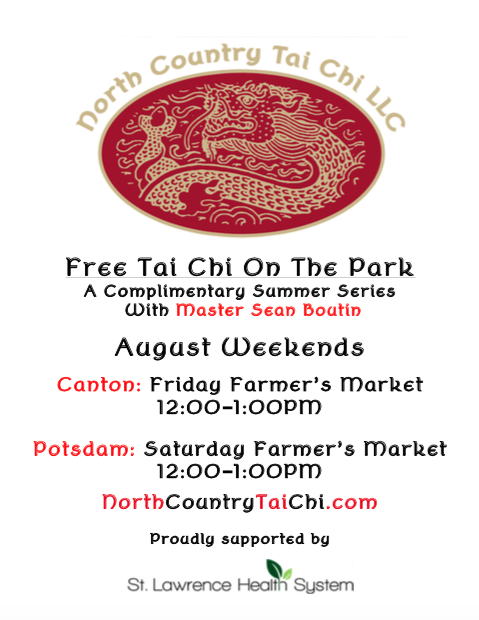 Join us for complimentary Tai Chi classes at either the Canton or Potsdam Farmer's Market during the month of August. These are playful classes and no prior experience is necessary. Classes aren't sequential, so drop in for any class you like even if it's the last. We are looking forward to meeting you! Special thanks go out to our friends at St. Lawrence Health System for sponsoring this event for a third straight season.